Here we go, the completed Asmodai Dark Angels Interrogator Chaplain in all his grim, dark glory. I did try and do a few things with this model from working on the banner to improving on another method for painting black armour. The only direction I was given was to make him look like the picture in the Codex and match the basing to the existing army color scheme. Easy enough right? The banner was optional, but since the backpack with the banner pole was included, I decided to do the extra work and add it on. My way of saying thanks for letting me do the project. This guy was a big boost for me when it comes to painting black armour and getting something that is not so flat, but at the same time doesn't look like another color that's just really dark. The picture below shows you what I mean. The black has some color to it, but it still reads as black. Maybe even better, it reads as black armour that has faded slightly due to wear and tear and old age. That would be a nice effect to be able to achieve. 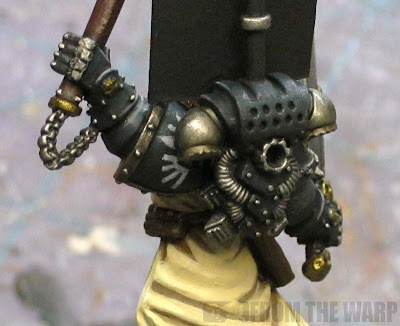 I also added a tiny bit of freehand and put the chapter symbol on his shoulder there too. Not that I was going to skip that little detail, but it's not something that jumps out and it's cool when you're looking at the model and notice it on there. Along the same line, I tried to make his beat stick (crozius) look like it is made of a finer quality wood like mahogany since that's the best to extract confessions with. A few passes with GW Baal Red over Scorched Brown gave me the look. I just didn't want it to have a "regular brown" look. Brown-red was ok, just not straight brown. If you shoot back up to the top picture, you might notice I made his eyes glow. It's a cool effect, but not the most pronounced on this guy. He's wearing a hood for starters and his head is tilted downward slightly too. You almost miss the effect completely unless you pick him up and look at him. Another tiny detail is the script on the purity seals. I know I've mentioned before about adding that to models. Do NOT use black for your script. It's too dark. I use GW Charadon Granite when I add it to models. It's dark enough to stand out, but not so much that it draws attention. And last but not least is the base. I tried to make it match the existing scheme based off of a pic that was sent me, but I'm not sure how close I got. I used what he did with his stonework where he had a few spot colors on there as designs that were inlaid into the stone. I tried to mimic that here and added a tiny bit of blue across the front stones. Hopefully it works well and makes a nice addition to his Dark Angels force. Now if they would just bring Asmodai back in the next Codex. You can see the Asmodai WIP post here. Did I build and paint my HQ wrong? Great work Ron. 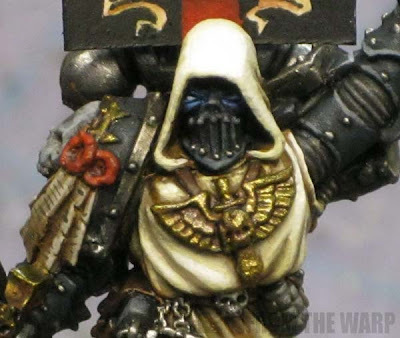 Nice way of doing the black armour too. Gotta say, I love your work. I'm painting a BT army right now and the line between trying to get to black and ending up with dark grey is ever so thin. 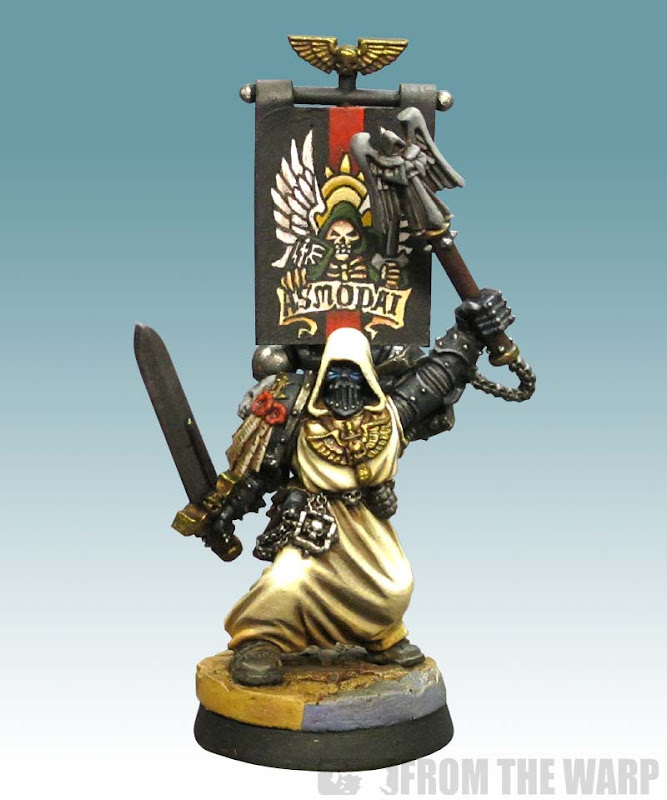 I think the mini looks great, but even at the most distant pic it looks dark grey. Great job though...love the banner! The black turned out great! Great mini! The banner is really cool. You started painting the robes from dark to light in 6 layers but the transition seems to be very hard. May be the photo haves too much contrast but anyway, the back side just behind the generetor is a good example of what I want to say. By the way if you painted the highest areas lighter you should let the others darker. Watch the 5th point (5.- Túnica y capucha) I think it will be very helpfull. He uses 4 colours: Base, 1st shadow, 2nd shadow and highlight. But you can use as much as you want if you remember using enough water! Congrats for the blog and sorry about my poor english! @paint2play I like the robes like that. Looks better from a distance. I guess it's a stylistic thing. Thanks guys I'm glad you like the way the black turned out. 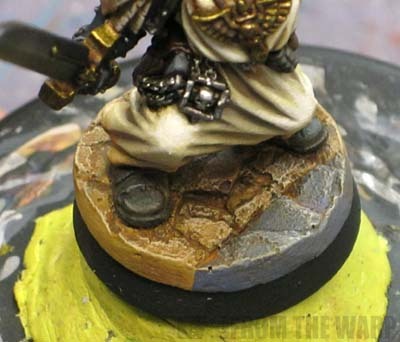 paint2play: Layering is one of those things that is part technique and part style. There is definitely a process to it, but I've found that as people learn how to do it, they develop their own method and their layering process will reflect their likes more than being "accurate" sometimes. My work is no different. I definitely appreciate the link! I think the harsh mistress that is digital photography comes into play here. On the tabletop or even a foot away, his robes look quite natural (no harsh lines). The banner is out-freaking-standing! And yes, the black armor looks...seasoned, worn, used, but not gray or washed out at all. Oh, and as Ron mentioned, the glowing eyes are like a hidden treasure. If you pick him up and tip him back, you see the eyes and they are just a very cool added touch. Thanks again for all your hard work, Ron! Asmodai is the centerpiece of my army, even if he's not in the current codex. TopKat: As long as you like him. My photography is usually spot on with the rare case of messing with the look of the models. Lots of times I get questions about things on models and I have to remember that I am not doing the model for myself or for the general public... but for someone in particular who may have asked for a certain effect or feature. Sometimes I think that does not come across in my posts as well as it could.